NEWS ANALYSIS: Norwegian government officials are once again mounting a major show of support for the United Nations, not least as the UN celebrates its 70th birthday this week. 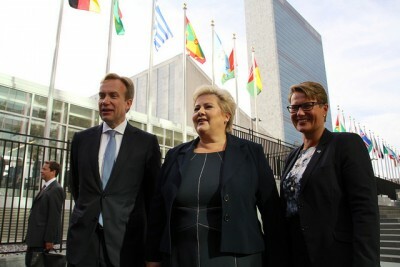 By the time the UN General Assembly formally opened for debate on Monday, Prime Minister Erna Solberg and her foreign minister, Børge Brende, already had several days of high-level meetings and appearances under their belts. The constantly globe-trotting Brende, who never stays in any one place for very long, was actually spending an entire week in New York. He and Solberg arrived late last week for the weekend’s three-day UN Sustainable Development Summit, highlighted by an historic address to the General Assembly by Pope Francis, a candidate for this year’s Nobel Peace Prize. While hundreds of thousands of other Norwegians were heading off on the autumn’s annual week-long school holiday known as høstferie, Brende was mingling with global leaders and making Norway’s presence known amongst them. On Friday, with the spotlight on the pope and the UN’s adoption of new sustainability goals for the next 15 years (Agenda 2030), Brende shoved his own 50th birthday into the background: “Isn’t it a great way to spend it, on the job,” he claimed to state broadcaster NRK during customary, semi-breathless interviews as Norwegian officials stride down a Manhattan street on their way to the UN Building. 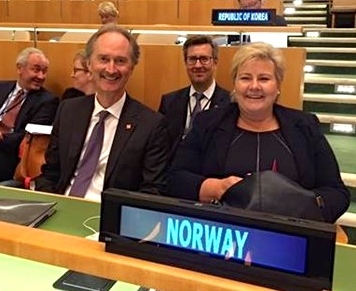 Even though Norwegians are quick to point out themselves that Norway is a small country, it has long had what arguably can be called a disproportionate amount of clout at the UN. The UN’s first secretary general, Trygve Lie, was a Norwegian and the UN itself has always been important in Norwegian foreign policy, regardless of whether a socialist or non-socialist government is in power. Norway has also long ranked as one of the UN’s strongest supporters, and among its biggest donors in terms of funding as a percentage of gross national product. 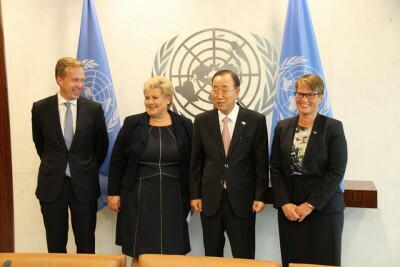 Geir O Pedersen, Norway’s current ambassador to the UN, told newspaper Dagsavisen last week that he believes Norwegian officials thus have a strong voice at the UN, are consulted on major issues and listened to by other leaders of nations much larger in terms of population and relative world power. Much of that, Pedersen says, is because of Norway’s consistent support for the UN when that of other countries can be unpredictable. In Norway, the UN is always a priority, in both Conservative-led governments, like now, or Labour-led ones. Pedersen has been Norway’s top envoy to the UN for three years, serving under both the former left-center government led by current NATO boss Jens Stoltenberg and now Solberg’s conservative coalition. He claims there are more similarities than differences in terms of setting priorities. This year the issues range from the sustainability goals to the war in Syria that’s set off a refugee crisis. “Syria is the most important now,” Pedersen told Dagsavisen. “Yemen will also arise as an important area.” This year’s UN General Assembly has attracted 150 national leaders to New York, and ranks as the largest gathering ever of presidents, prime ministers, foreign ministers and other leaders from the UN’s 193 member countries. It’s also a magnet for the heads of large international organizations, business and finance bosses and other lobbyists. On Friday, Solberg met with everyone from German Chancellor Angela Merkel to California Governor Jerry Brown and Microsoft founder Bill Gates. She met with a group battling radicalization of young Muslims, the president of Vietnam and the prime minister of Lebanon. While much of the handshaking and conversation may seem stilted or superficial, it carries symbolic value and builds a foundation for future relations. 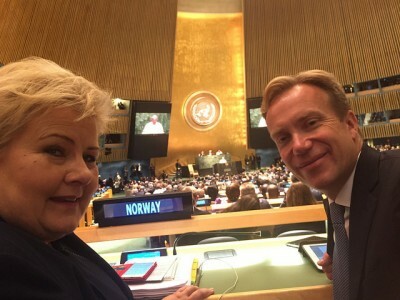 Solberg was among those addressing the UN on Friday, and she urged world leaders to continue to cooperate on sustainability in advance of the UN climate summit in December. She also called for UN member states to increase their funding for humanitarian and development aid, to invest more in education and health care programs and to improve governance. She stressed equality and environmental protection. They were all familiar themes, which Norway has pushed for years. At a so-called “dialogue meeting” with, among others, Merkel and UN Secretary General Ban Ki-moon, Solberg also borrowed some song lyrics from the late Elvis Presley, urging “a little less conversation, a little more action, please.” Elvis had other things on his mind in connection with the song, but it sparked some humour amongst others on the panel, who also cited such iconic lines as “Always on my mind” and “Don’t be cruel” in their dialogue on humanitarian issues and sustainability.